After leaving Kagoshima we drove for 5 hours, it was a tough one! But the sceneries were amazing so it was totally worth it! 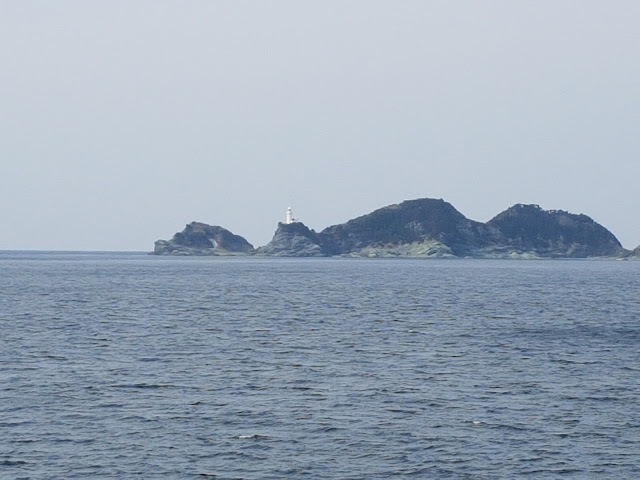 I believe Kyushu is one of the most beautiful places I have been. I guess I am a bit biased, as I lived in Fukuoka for a year. Still, Fukuoka is in the top 10 of most liveable cities in the world. I am happy about others realising this about Fukuoka. 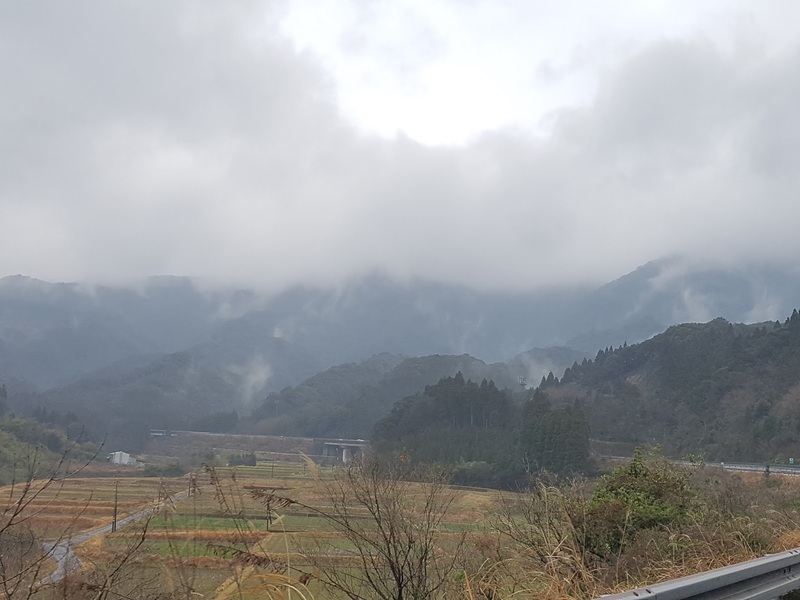 Still, there are also other beautiful places in Japan, I just can't get enough of this country! 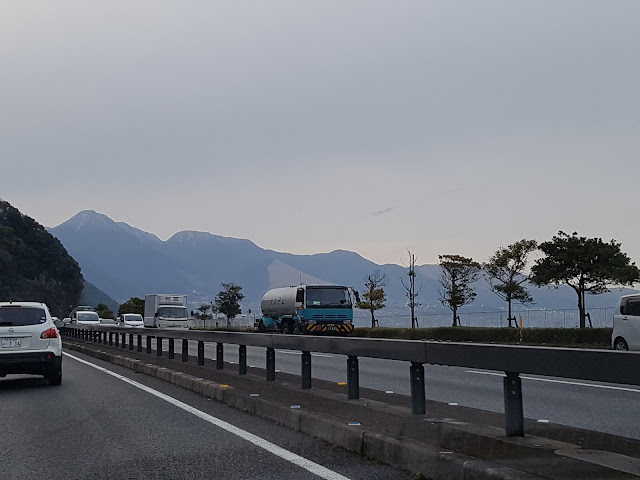 We drove from Kagoshima to Oita city, we didn't take the full highway option but did the 'touristic route' for the first part. This landed us in the most 'middle of nowhere' places you can imagine. Would not be the first time nor the last time we will see places like this. 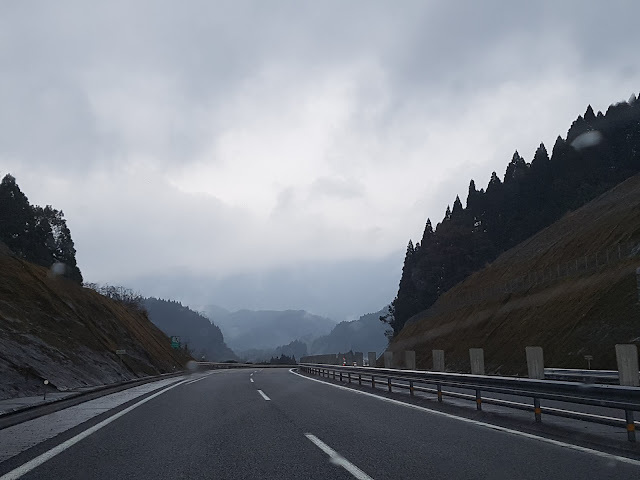 Going on the highway, we had beautiful sceneries of mountains, sea, tunnels (well, going in and out of them at least), and of course we saw a lot of Toyota Crowns, my favourite car, whooshing past us effortlessly. 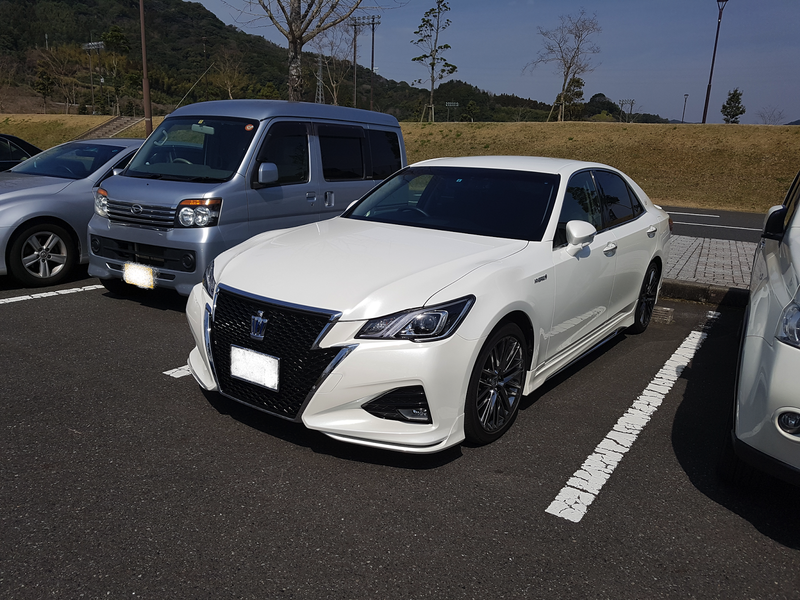 I really love this car, its design is right to my taste. And of course next to it there's the 'box' type car which you also see a lot in Japan. One type is literally called the N-box from Honda. We saw a lot of these as well, funny how it's so self-aware that it's a box hah. The weather was quite bad, rainy and foggy. But this kind of weather produces the most beautiful pictures of foggy mountains. Driving on the highway we again encountered tollbooths who we paid (not so little) money. What I noticed was that there were mostly older men working at these booths. Also in the service industry such as cleaning and serving (older women) taxis (older men) and etcetera. Coming to Singapore I found that there were a lot of (very) old people still working here as well. The tollbooth men always told us to be careful ergo drive safely, always very polite and some of them even extra nice and helpful. After 6 hours we finally arrived in Oita City. It was a 5 hour drive but we took a break on the road at a konbini. It was a family mart in the middle of nowhere, so middle of nowhere that people were startled to see us, two foreigners. They kept staring, the staring gets more intense the more middle of nowhere you go. 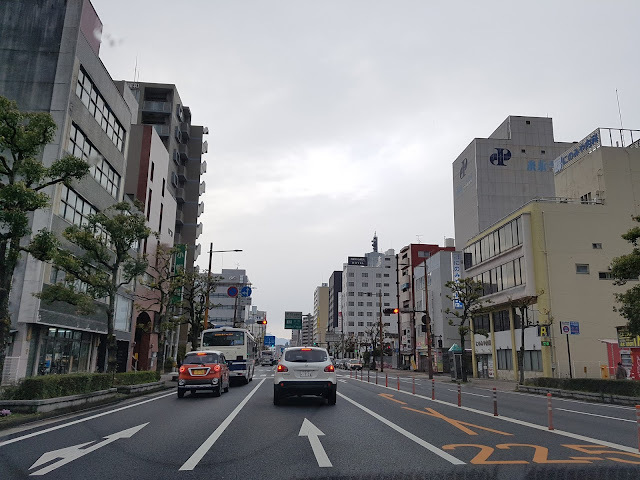 Oita City was not a nice place. From all the cities we have seen so far this is the least appealing one. 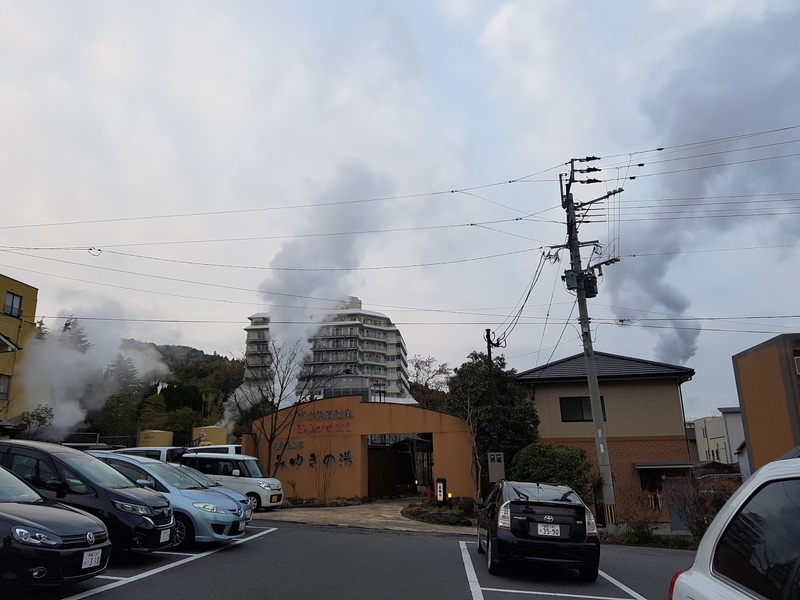 That's why after checking in at our hotel and dropping our stuff, we decided to drive to Beppu and have the real onsen experience. I had been to Beppu before, but my husband hadn't. Therefore I thought it would be good for him to see the 'hells' as it is called of Beppu. Beppu is one of the most famous onsen (hot spring bath) touristic attraction of Japan. 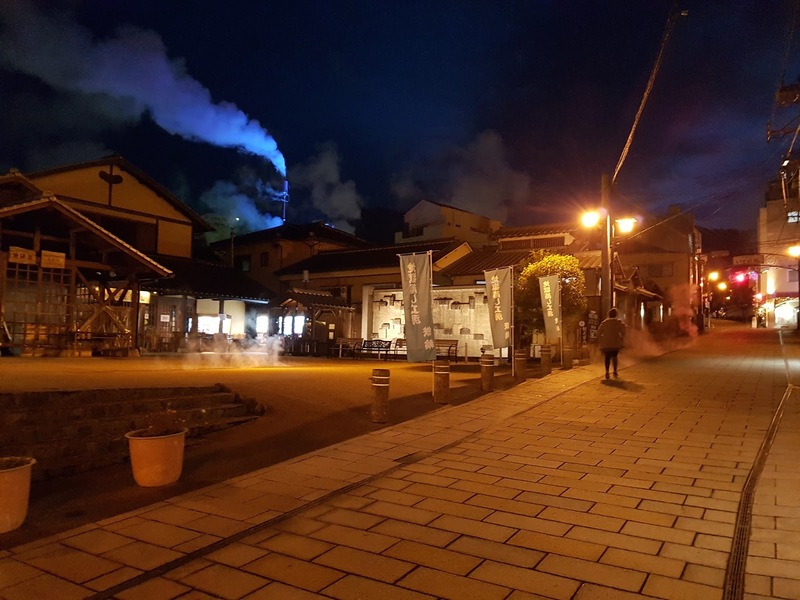 Many foreigners and locals come here for the onsens and the spectacular views of the hells: steaming hot springs. 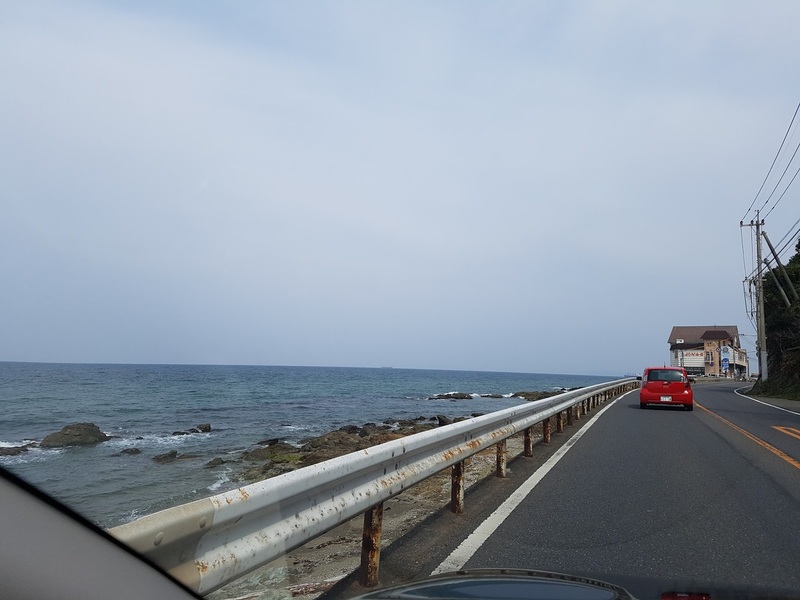 Driving from Oita to Beppu was also spectacular, the views of the sea and mountains were amazing. 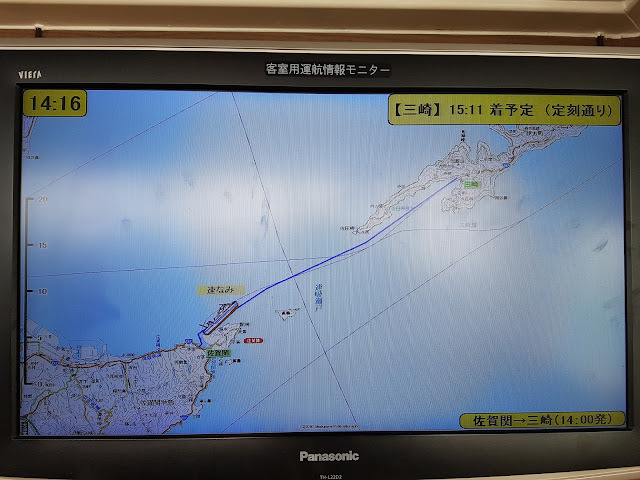 It was only a half an hour drive to Beppu, so having a car was really handy in this situation. 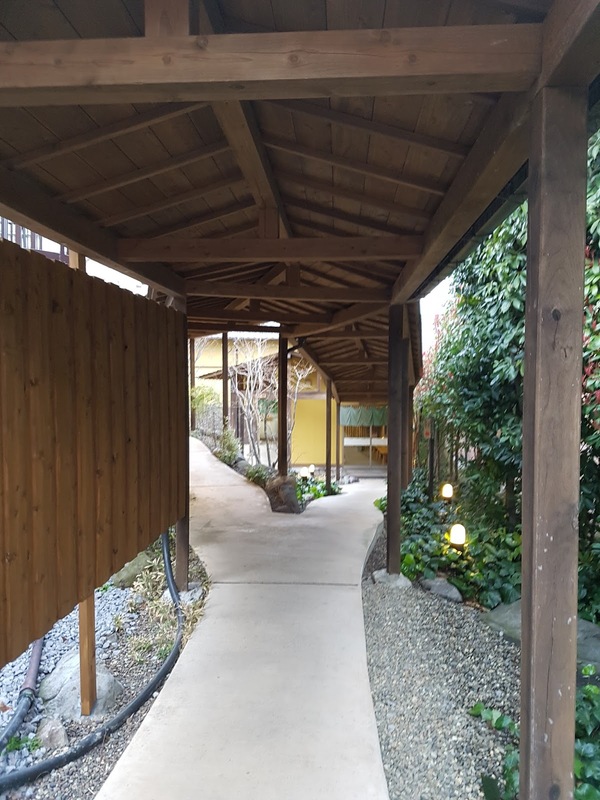 Before leaving the hotel we had googled some onsen that had 'family' or 'couples' rooms, so me and my husband could bathe together because women's and men's baths are mostly separated. Driving uphill we found out why this place is called hell, there was smoke coming from different places, which made it eerie yet mysteriously exciting. We drove up to this onsen and were pleasantly surprised at how amazing it looked from the outside already. This place is called 'Miyuki no yu'. Inside we discovered a very serene place. I really love how some onsen have a beautiful interior which makes you calm already! We booked a room for 1.5 hours, it cost 2500 yen for an hour and every extra half an hour is 1000 yen. You can bring your own towels but you can also buy a small towel for 100 yen and rent bigger ones. It is more expensive then a public baths, which are to my experience between 300 and 600 yen without a time limit, but at least you can enjoy it as a family or with your partner. As we still had time we decided to have some dinner in the neighbourhood. We found a small place where we had some kaisendon and katsudon. 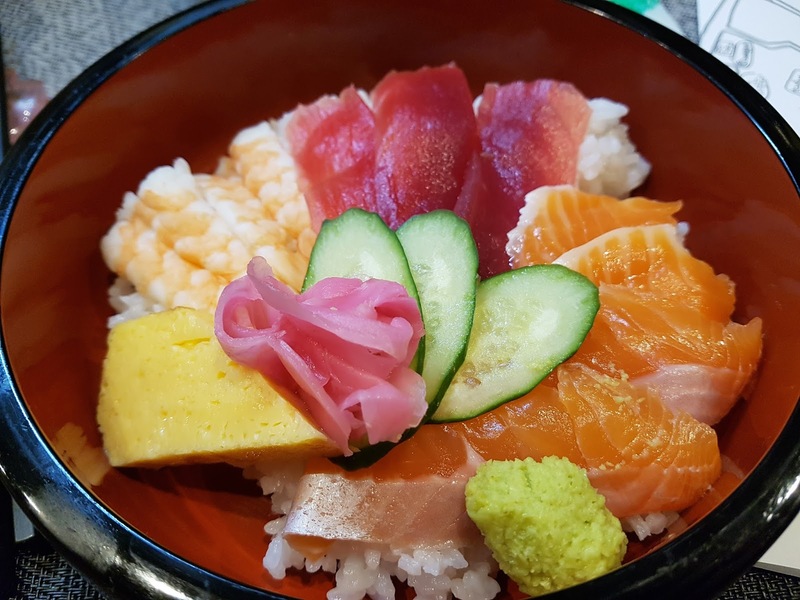 Don is short for donburi, meaning 'bowl' which is a rice bowl dish with various toppings. I had some kaisen-toppings, kaisen means seafood. It was quite delicious, and one of my favourite foods. After eating we walked around, it became dark quite fast! But boy, we had the most beautiful views! Steam lit up with colors, steam coming from the pits below you, as the weather was quite cold I liked standing on them to heat up a bit. After our walk it was time to go into the onsen! So getting in the room, of course you take your shoes off, this is a normal thing in Japan when you enter an onsen, a house, or even some traditional restaurants. We had an inside bath and a 'rotenburo' which is an open-air bath. So before you enter the bath you take off your clothes, go into the bath area where there usually is a place where you can wash your body before you enter the bath - this you should always do before entering a bath. We first enjoyed the inside bath, this one was quite ok. Of course it was hot but because there were glass doors between the changing room, inside bath and the outside bath, the inside bath had a lot of steam so that was very nice. The outside bath was VERY hot. But the nice thing was, because the air was quite cool, going out of the bath you cooled down and then you get in again, and repeat this. Every now and then go to the inside bath too and enjoy the steam. It was a very relaxing experience. What I especially like is the streaming water sound of hot water getting into the bath, it's so calming! I also like the big rocks giving it a feeling as if you are in the nature, an area with a lot of mountains instead of a city. After a relaxing bath we drove back, the nightview of Beppu is also very nice. We parked our car in the hotel 'vending machine' car park, and called it a day. The next day we went out to get something to eat. 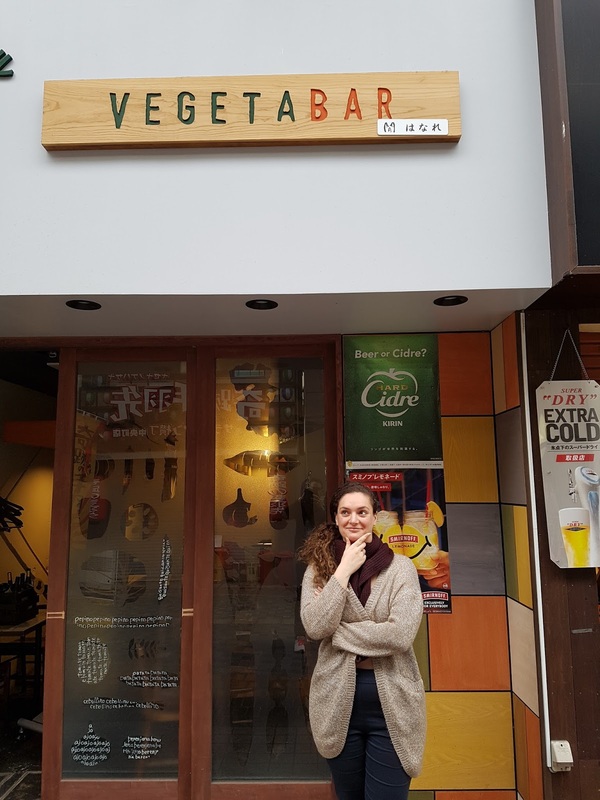 We found an 'omuraisu' place. Omuraisu is basically omelette with rice, with some sauces. 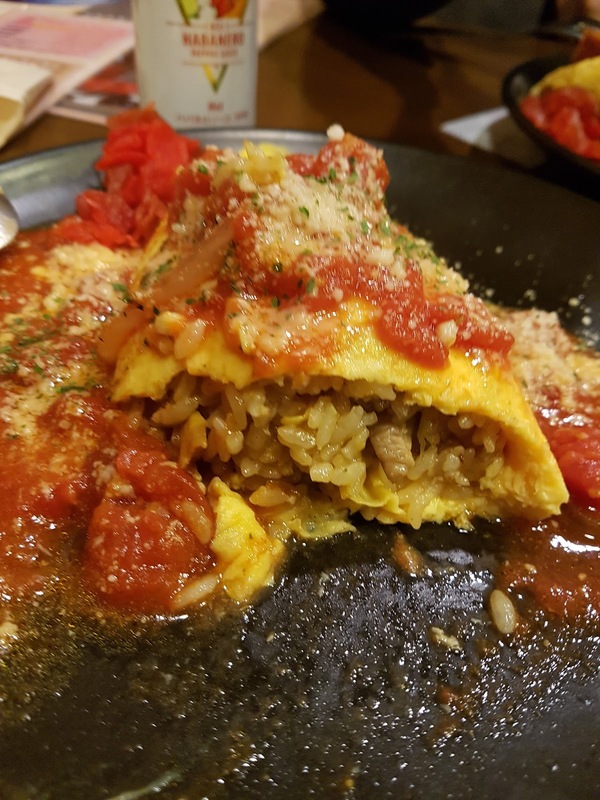 We could choose different kinds of omuraisu. 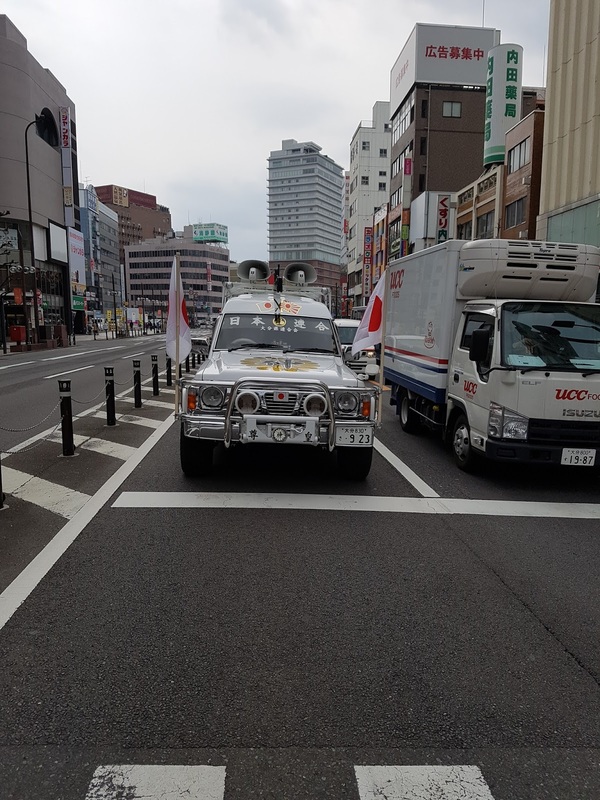 After eating we saw an ultra-right wing car, they look so cool though. 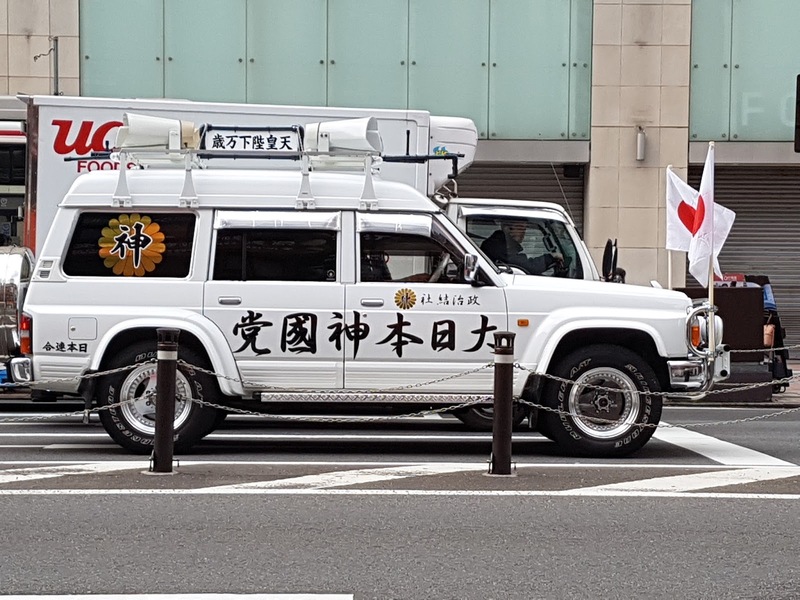 Like a ghostbusters car or something. We saw this place, I just had to take a picture with it. 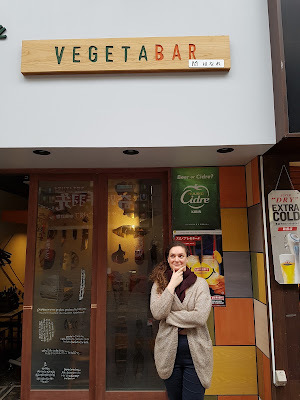 Unfortunately, I did not see Vegeta here. After breakfast we got our car and it was time for one of the longest rides of our trip: Oita-Miyoshi. 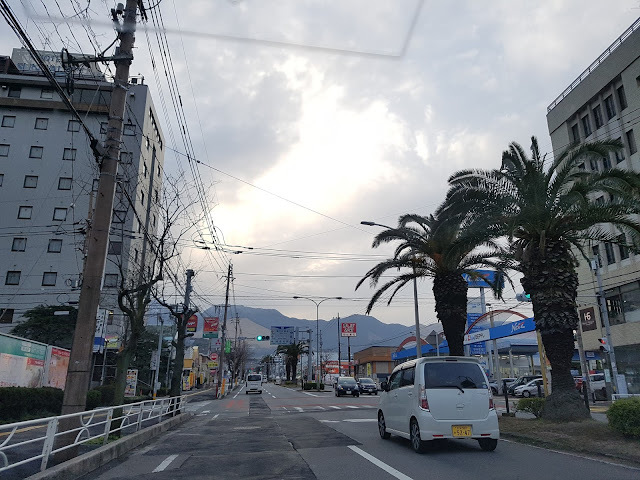 Well not exactly Miyoshi city but somewhere in the middle of the mountains lies our destination. 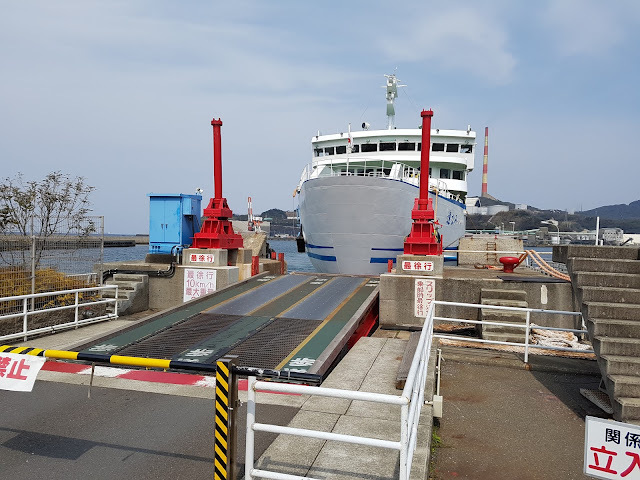 We drove up to the port and took the ferry to Shikoku. After arriving in Shikoku it was time to drive up to our hotel with an onsen, the Oboke Sunriver hotel. It took us about 5 hours to get there. It was one of the most beautiful drives ever, with sea on both sides of the road and mountains, more on that in the next blog! So stay tuned..
As an extra I will give some bonus information about parking in Japan. So of course there are parking garages, but in bigger cities there are parking spaces, sometimes even really small with just 4 parking spaces or something. 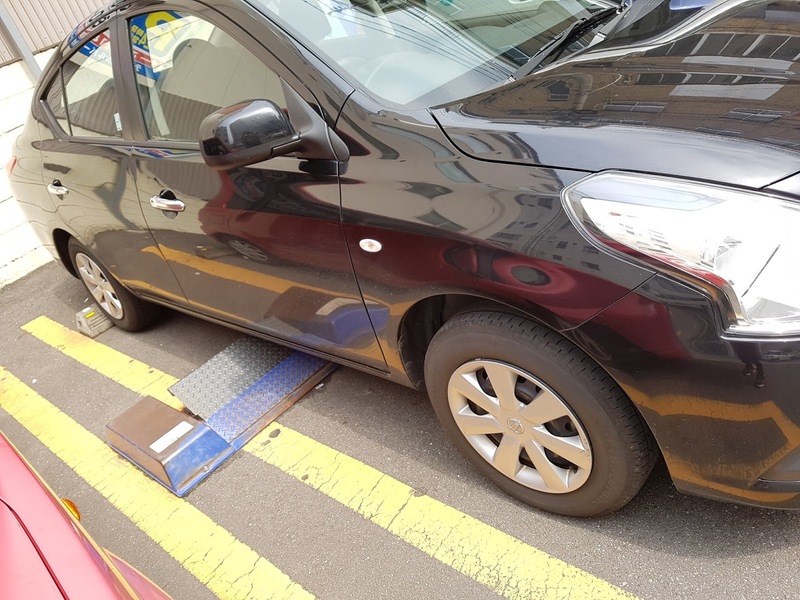 Here there is an automated system to keep your car 'in place' so you can't drive away without paying. First of all, drive (preferably backwards) into the parking space, over the blue hump you see there. 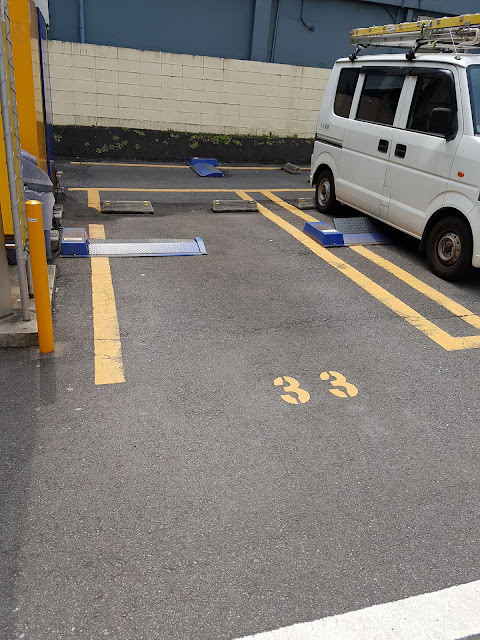 This is the parking block that will go up after you park your car. After parking, the block will go up. No worries, it (probably) won't damage your car. It didn't ours anyway. Then you can just walk away, do your thing, and come back whenever you are ready to take off. 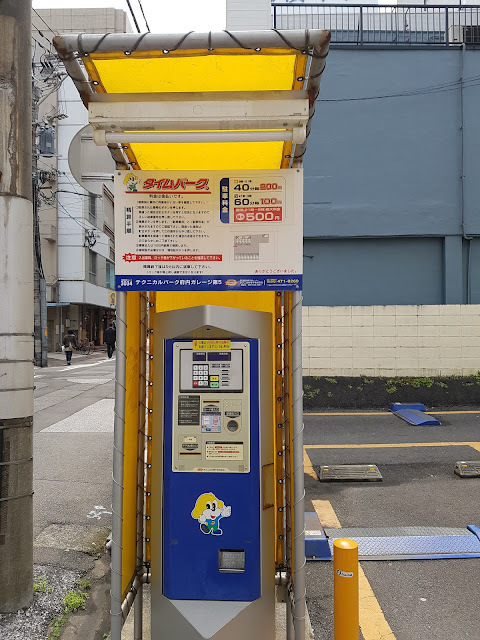 To pay simply input the parking space number after which the machine will automatically show the amount that is due. After you pay the block will go down but you will just have a limited (short) amount of time before the block goes up again, so drive over the block and then input your next destination into the navigation, take a sip of water, or do whatever you want to do. Parking is quite costly in Japan, so if you want to travel cheaper than I would definitely advice to get a JR pass, an unlimited public transportation pass which you can only get outside of Japan. However, a car takes you places you would normally not get to. Either way, preparation is key for trips to Japan! Off to our next leg! 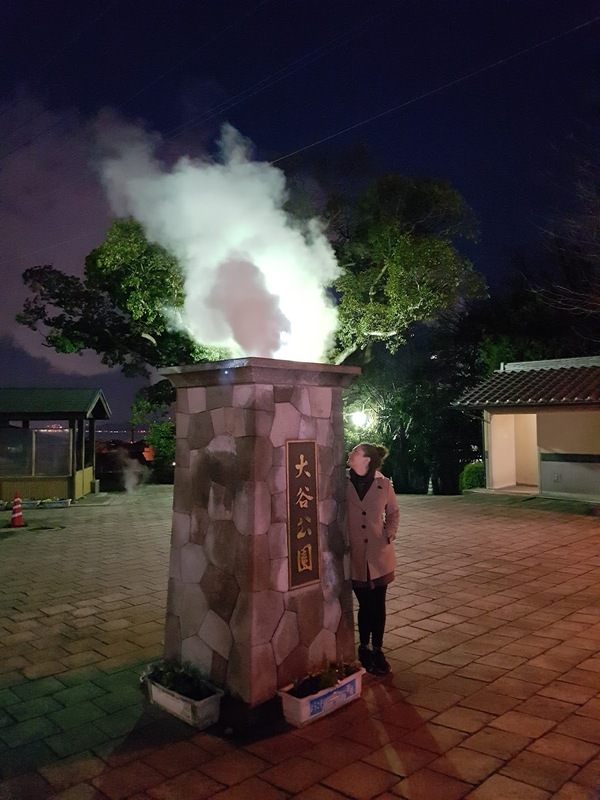 No Comment to " Devi's Japan Travels Part 3: Onsen Paradise "